Brandon Graham — Last year’s first round pick had a promising, if not spectacular rookie season. Graham would have been the guy we all expected to step up and provide the complementary opposing pass rush to Cole, except that he tore his ACL in Week 14 against the Cowboys. Now, instead of improving on his rookie performance, he’ll likely still be rehabbing when the season starts. Andy Reid called it a “real stretch” to expect Graham back in time. Juqua Parker — He had another solid season, but was exposed late in the year by quarterbacks as bad as Joe Webb (I was at that Vikings game, and I can’t get the image of Juqua getting consistently fooled out of my head). The truth is that if Graham hadn’t gotten hurt, Parker would probably be expendable this offseason. He’s already 33 years old. How much left is in the tank? Darryl Tapp — The former Seahawk, acquired before last year’s draft for Chris Clemons, had a mediocre first season. He had almost as many pass rush opportunities as Parker, but caused significantly less pressure. At least he’s only 26. Daniel Te’o-Nesheim — For a third round pick, Te’o-Nesheim had a remarkably unimpressive 2010. In fact, he barely got on the field — more than half of his season snaps came in the Week 17 reserves game. Hopefully Te’o-Nesheim can improve enough to contribute something, but he hasn’t shown anything yet. Ricky Sapp — Not much to say other than he was on injured reserve all of last year. He’ll have to prove he’s back to full form to even have a shot at the roster, let alone get substantial playing time. Victor Abiamiri — A weird quirk in the free agent rules means Abiamiri will be back after missing all of 2010 after microfracture surgery 16 months ago. I have no idea what to expect, since he’d never shown all that much before the injury. Philip Hunt — 2011 will be Hunt’s first year in the NFL. After breaking the sacks record in college at Houston, he wasn’t drafted and ended up playing two seasons in the CFL. 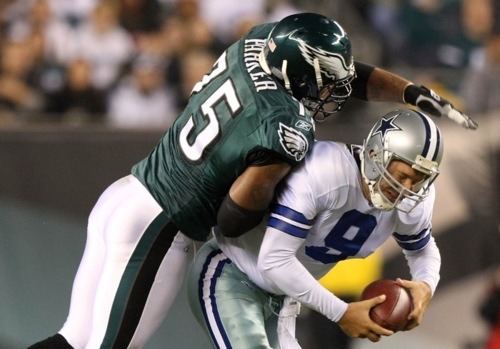 Last year Hunt led that league with 16 sacks and subsequently the Eagles signed him in January. Best case scenario he replicates Miami DE Cameron Wake’s similar journey, but that’s obviously a longshot. The uncertainty surrounding each of these players is only compounded by the fact that new defensive line coach Jim Washburn is installing a completely new system that may play to different player strengths than the previous Eagles scheme. Trying to sort out the wheat from the chaff in this scenario seems impossible. I wouldn’t really be surprised to see any one of these guys start; nor would I be shocked if anyone outside of Graham was cut outright. Then of course there’s the possibility that free agency could bring new contenders into the mix. Ultimately, if and when training camp ever starts, defensive end looks like the position to watch. For such an important spot, its outlook might be the most murky of any on the team. Photo from Getty. Originally published at NBC Philadelphia. Tagged with Philadelphia Eagles, Defensive Line, Defensive End, Trent Cole, Jim Washburn, Brandon Graham, Juqua Parker, Darryl Tapp, Daniel Te'o-Nesheim, Ricky Sapp, Victor Abiamiri, Philip Hunt. June 1, 2011 by Brian Solomon.